2:58 I'm done for the day. Thanks for coming. See you next week. Take some courses. 1:34 sometimes you have to ask "What is NOT happening?" than yesterday's. Suggests another possible rally - all we need is some juice. learn to use the FOP overlay. Then take CTME, and FOG. 10:04 looks like the hedge fund computers scalped the report. They should be done now. 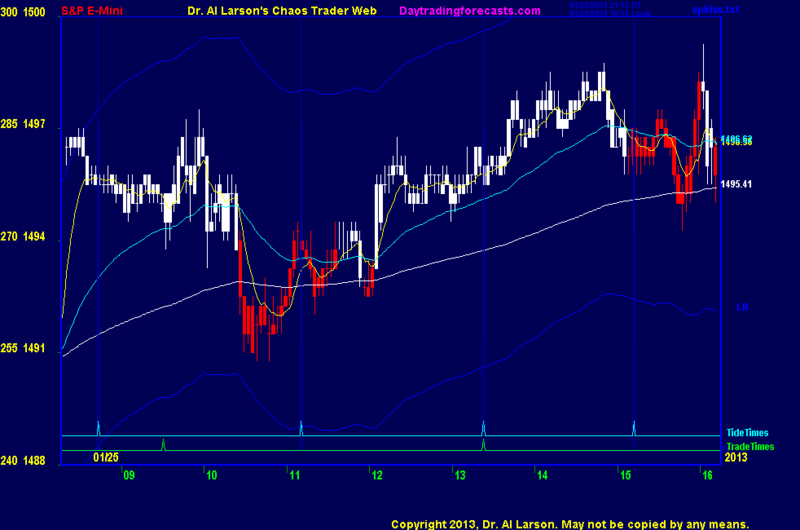 9:20 the major problem today is volatility - will we get some or not? 1/25/2013 1:08:20 PM MT SPX:: Thank you, Al. 1/25/2013 1:01:14 PM MT Al****:: SPX - stargo is an energy pattern. It occurs on many different time scales. Since it is a general energy pattern, many tghings may follow it. But the only one I've done much work on is the S&P. 1/25/2013 11:56:16 AM MT SPX:: Hi Al, is Stargo a long term projection model? can it predict other markets or stocks? if it can, would you provide some examples? Thx in advance. 1/25/2013 11:47:51 AM MT JMV****:: Nice shooting Al! I've been long 95.5 since 12:09 EST! 1/25/2013 8:22:19 AM MT BBB****:: Al, one thing I have never understood is why to even take a trade at 9:31 if the original tide time was more than, say, 10 or 15 minutes earlier. i.e. today the first tide time was at 8:44 Eastern - a full 45 minutes or so before the open outrcy - the normal "window" being 45 minutes on each side of the tide time.... is it even worth it? 1/25/2013 6:57:50 AM MT BBB****:: Morning all - awesome teaser on the new course Al. 1/25/2013 5:51:16 AM MT mm****:: gm all - have a great day - let's hope for good volatility for the Clinic and not an MM stinker !